The past few months have been very fortunate for Servals. Close on the heels of Servals being recognized by InfoDev (a program of the World Bank)as one 8 companies identified as leading the technological innovation for climate change, we also found out that we have been nominated as a World Economic Forum Technology Pioneer Candidate for 2011. The World Economic Forum, well known by its annual meeting in Davos every year, is an independent international organization committed to improving the state of the world. With a mission to catalyze entrepreneurship in the global public interest, the WEF is striving to develop an integrated value chain by involving world leaders in communities, inspiring them with strategic insights and enabling them through initiatives. • Develop and apply the most innovative and transformational technologies. 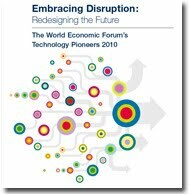 • The innovations should reflect society’s attempts to harness, adapt and use technology to change and improve the way business and society operate. • The work undertaken holds the promise of significantly disrupting the way business and society operate. • Must demonstrate visionary leadership, show the signs of being a long-standing market leader – and its technology must be proven. All of us at Servals are truly honored by this nomination.